The Hard Water Test Kit will show you how hard your water is in grains or ppm. It’s simple to use and performs approximately 50-100 tests. It’s a tool we created to help you determine when your WaterStick water softener needs to be regenerated but it can also be used if you just want to know the hardness of your tap water. 1. Add the water you wish to test to the etched line on the vial. 2. Add 1 drop of solution, cover (with the palm of your hand or with the lid) and shake vigorously. If you see at least 1/4” of suds (bubbles) then you have completely soft water. If not, see #3. How will the test kit help you know when you’ll need to regenerate? Note: Example below is for the “ShowerStick” but can be similarly applied to our other WaterSticks. 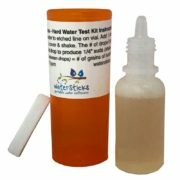 After receiving your ShowerStick, you can first use the hard water test kit (included) to test your tap water to see what your actual water hardness is. After you install the ShowerStick, let the water run for a couple minutes then use the test kit and you’ll see that your water is now soft (0-3 grains). (Note: Don’t test the water after regenerating because it will give you a false positive since the salt will test as a mineral. Let the water run for at least 2 minutes then use the test kit.) After you take a couple more showers, test the water again. Continue to do this until the test kit starts to show the water is no longer soft then you’ll need to regenerate your ShowerStick. If you determine it needs to be regenerated after every 5 showers and you take 5 showers per week then you can make a mental note to do it every Monday for example.